Usually, birds of a feather flock together—but in the Amazon, some flocks feature dozens of species of all shapes and colors. A new study by San Francisco State University biologists singles out one reason why these unusually diverse flocks exist: lookout species that call in alarm when they spot dangerous predators. Researchers have pondered the existence of these mixed-species flocks for decades, especially because of their stability. "You come back to the same habitat after 20 years, and the same flocks are using the same areas of the forest," explained San Francisco State Professor of Biology Vance Vredenburg. "It defies a lot of expectations." But scientists did have a few clues. One ubiquitous group of flock members are species whose calls alert their neighbors to the presence of threats like hawks or falcons. "People have thought for a while that maybe these 'sentinels' promote the ability of other species to use risky parts of the forest," said lead author Ari Martinez, who was a postdoctoral researcher at SF State during the study. By opening up new habitat to their neighbors, they might also bring together species that would normally flock on their own. The results support the idea that alarm-calling species might allow their neighbors to live in dangerous neighborhoods. 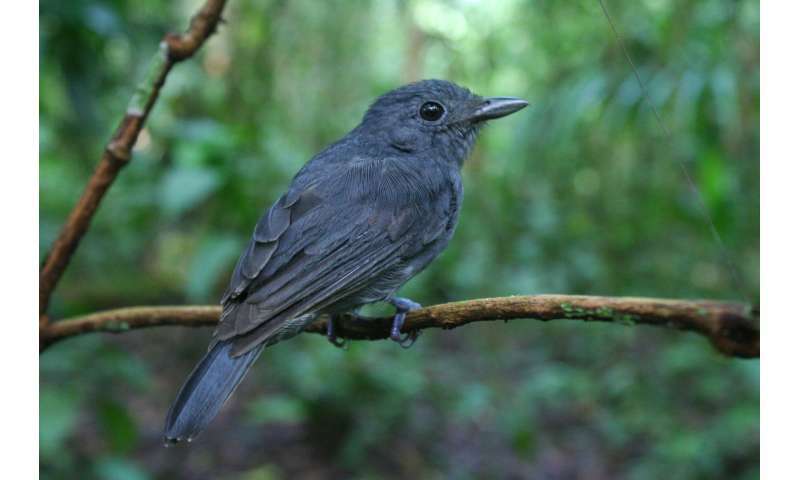 "These flocks occupy a middle layer of the rainforest that's not quite the ground and not quite the canopy," explained coauthor Eliseo Parra, a lecturer and researcher at San Francisco State. "A lot of literature suggests that this area is more dangerous. There are more opportunities for a predator to be hidden and still have a quick flight path." Remove the antshrikes and their former flockmates are left exposed, so they retreat to safer habitats. Another consequence of the removal is that almost all of the members of mixed-species flocks spent less time with the bulk of the flock. "Some species would retreat to one habitat, and some individuals to another," said Parra. "From an anecdotal perspective, you no longer saw a flock." Even if they don't look the part, this makes alarm-calling birds similar to "keystone species" that have an unusually big effect on their environment, like beavers and wolves. Antshrikes may not have a large impact on their physical environment, but they influence the behavior of many other species by creating a safe zone from predators. "It's a way that species diversity might be maintained in the forest," said Martinez, adding that this could make them valuable targets for conservation efforts.